Many families use websites such as Shutterfly or Snapfish to make beautiful photo books, photo prints, or Holiday cards. They are super accessible, and easy for the average (or advanced) consumer…with a ton of cool templates! On the other hand, although these websites provide some super fun gifts, we have to be careful with storing our photographs on them. The reason being, they should not serve as the only backup for your photo collection. One would think that once you’ve uploaded your photos to these websites, you’d be able to get your images back with no problem. However, what a lot of people don’t realize is that these sites were never intended to be permanent cloud storage. These companies simply act as a server to design photo gifts, and not to be used as a backup for photos. 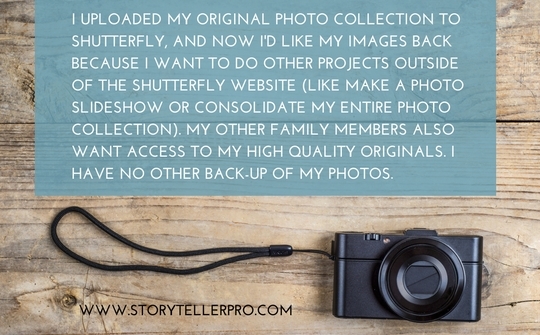 Many clients think, I’ve uploaded and organized my photos on Snapfish, what does it matter if my external hard drive died or if I lost my originals – I can view my photos any time I want. Sure, you can definitely view your images, but the reality is that these sites make it a slow and tedious process to get your images back… without actually paying money or spending invested time downloading high res pics one at a time. 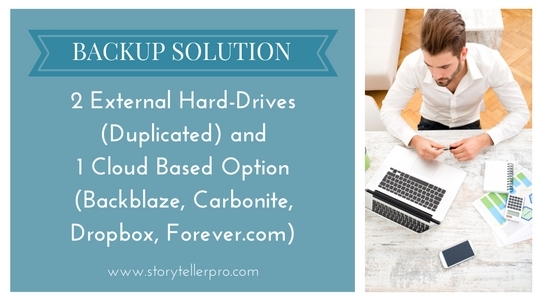 Our recommendation is to always store your original pics independently of software on at least 2 duplicated external hard drives, plus one cloud option including Backblaze, Carbonite or Dropbox. For permanent cloud storage for your consolidated photos, Forever.com is a great option. Make sure to always change out your external hard-drives every 3 years, and test them when it’s time to turn the clocks for daylight savings. If you love Shutterfly or Snapfish, and want to continue working with such photo gift websites, you can certainly do so! 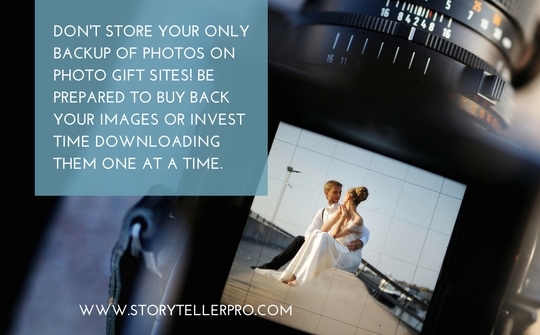 Just be sure that the photos you are uploading are not the only “backup” of your originals. It’s always better to have your photos backed up somewhere, outside of any software platforms, so you can access them if there are future problems with whatever software company you are using to view your photos. What if my photos are stuck on one of these sites? If you do have your only originals on these sites, we really recommend extracting them as soon as possible. We’ve posted instructions on how to do so from Shutterfly and Snapfish (see below). If you’re leery of doing this on your own, contact us for a Photo Organizing Session to get you on the right track to storing your photo collection. How do I get my original digital photos off of shutterfly? If you only have a couple of images that you’d like to extract from Shutterfly, you could double click on the thumbnail of the desired photo. This will enlarge the thumbnail to a larger preview. From there, hit ctrl + click. A tab will pop up, and you can select the “save image as” option. This will save a low resolution copy of your original photo to your computer. Granted, a low res copy can still look very pixelated when trying to reprint or reproduce in other formats, and we recommend obtaining the full resolution photo. How do I get my original digital photos off of Snapfish? It’s a little bit more tricky to get your original photos off of Snapfish for various reasons. 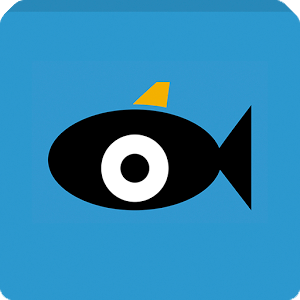 Originally owned by District Photo, Snapfish was sold to Hewlett-Packard in 2005. Back then, you were able to buy archival discs of your whole library for payment (like Shutterfly). But then somewhere along the line, they changed their process so the archival discs were no longer available. Hence, Snapfish’s Classic Website began to offer the downloadable batch zip files, including up to 50 images at a time. However, in November 2015, District Photo reacquired Snapfish as Hewlett-Packard wanted to split and refocus its operation. As of today, Snapfish’s Classic Website is no longer available, and Snapfish users who want to extract their original high quality photos have to download them ONE AT A TIME. In order to to this, you’ll have to click the photo which you want to obtain, and hit the “download” button on the top right. Granted, this can be very tedious for people with collections of 200+ photos who have their originals backed up to Snapfish. For those clients who want to extract their photos from Snapfish, we recommend downloading your “A Select” photos a little bit each day. It will probably take about an hour to download anywhere from 180-250 images depending on your internet connection. Do you have comments, suggestions or questions about this blog post? Please share your thoughts and join the conversation!